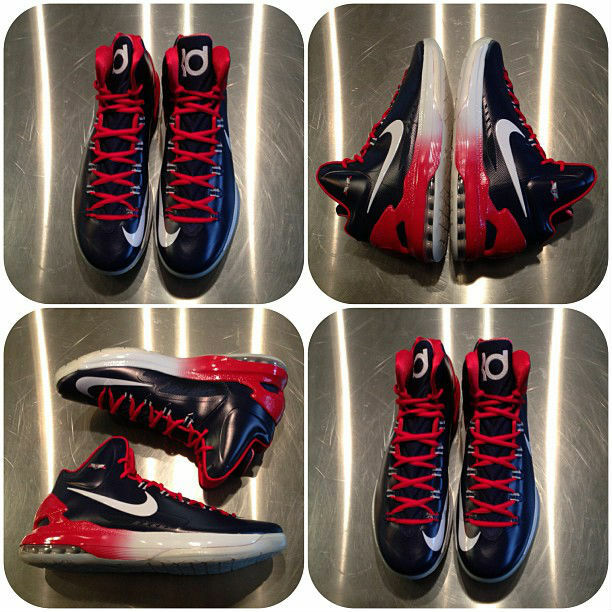 Following yesterday's look at the team exclusive make-up for St. Benedict's Prep, a second National High School Invitational Nike KD V colorway has surfaced. Styled in the colors of Nevada's Findlay Prep Pilots, this KD V features a dark obsidian upper, white Swoosh branding and red on the inner lining, laces and heel counter. A red-to-white gradient transition was used on the shoe's midsole, which sits atop a translucent rubber outsole. The Pilots' logo appears on the lateral ankles. What do you think about this exclusive KD V colorway?